Are you ready to dive into the 15th Century (1401-1500) with me and Sir Thomas Malory. I was perusing my shelves the other day and ran across an old copy of Le Morte D'Arthur inherited from my late mother-in-law. 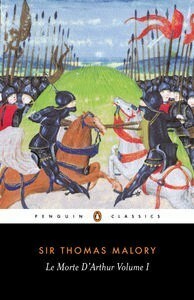 I love the front cover which states it is 'the Heroic and Lusty epic of King Arthur and His Knights of the Round Table.' The pages are quite yellow and the print is very small, so much so that I think I'll let it continue to languish in its glory on the shelves and download a version to read on my ipad. I also found a wonderful site ~ Arthurian Legends ~ with fine art drawings created in the 40's by belgian artist Francoise Taylor, plus links to many informative arthurian websites. Since I'm also armchair traveling over to England this month, I've discovered a wealth of historical fiction at historicalnovels.info and the always informative Goodreads list of 15th Century popular literature. And my backpack is overflowing with a wide variety of books set in England from Elizabeth Chadwick's historical The Greatest Knight to Margaret Frazer's 15th century first book in her Dame Frevisse's series - The Novice's Tale to Virginia Woolf's Mrs. Dalloway, Jacqueline Winspeare's A Lesson in Secrets and Suzanna Clark's Jonathan Strange and Mr. Norrel. I may just end up settling down in a cozy cottage on the heath for a month or two or three. *grin* We'll see. Join me in reading a book set in the 15th Century and/or England. I'm going to check out that website about King Arthur. Thanks for the tip.